Nourkrin® Man with the unique Marilex® helps support, normalise and maintain the Hair Growth Cycle by carefully providing the correct nutrients to the hair follicles. Today, the award-winning Nourkrin® Man is appreciated by men around the world. It takes time to get in the system but once there stops further loss of hair when used for the first time you notice it more clearly! The formula has got all the right ingredients and Nourkrin® seem to be up on current trends an add accordingly its the best solution so far! The next step would be a hair transplant and using Nourkrin® as a support for the new hair. 50% of men will experience hair thinning before the age of 50. Yet, no matter what type of hair loss occurs, the Hair Growth Cycle is almost always affected. Genetics, Stress, Diabetes, Poor Nutrition, Hyperthyroidism, Cholesterol, Medication, Hypertension, Hairstyling and others. Nourkrin® Man with the unique Marilex® is a scientifically formulated male hair loss treatment for health-conscious, modern men, who want to maintain a normal Hair Growth Cycle, which helps to support normal healthy hair growth. With Nourkrin®, you get what you deserve as the product has been featured in numerous clinical peer-reviewed papers and is used globally as a primary therapy to address hair growth disorders. Nourkrin® Man is completely safe and 100% drug-free. Apply Nourkrin® Shampoo & Scalp Cleanser to wet hair. Massage thoroughly into the hair and scalp. Leave for 2 to 3 minutes. Rinse well. Suitable for all hair types including fragile and delicate hair. Suitable for daily use. 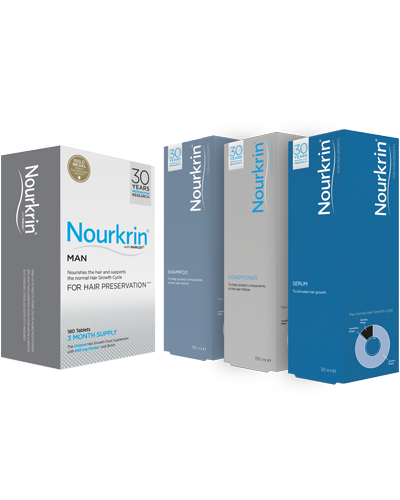 For best results use the complete Nourkrin® range of supplements, scalp lotion, shampoo and conditioner. Keep out of reach of children. For cosmetic use only. After washing thoroughly with Nourkrin® Shampoo & Scalp Cleanser, apply Nourkrin® Conditioner to the full length of the hair and massage into the roots. Leave for 2 to 3 minutes. Rinse well. Apply twice daily (morning and evening) directly to dry scalp in the areas where hair thinning is occurring. Spread with fingers and leave to dry. Suitable for all hair types including fragile and delicate hair. Recommended for daily use. 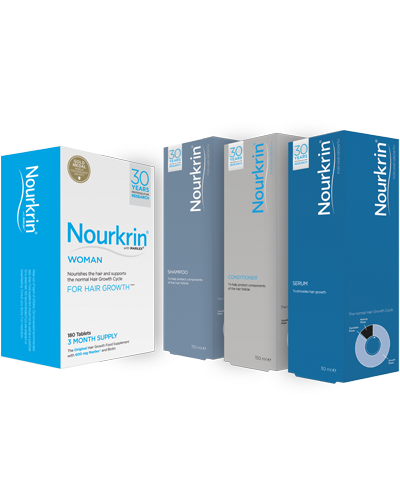 For best results use the complete Nourkrin® range of supplements, serum, shampoo and conditioner. Keep out of the reach of children. For cosmetic use only. Avoid eye contact. Marilex® (fractionated fish extract with specific lectican proteoglycans), acerola cherry extract (malpighia punicifolia), fenugreek (trigonella foenum-graecum), silicon dioxide, horsetail extract (equisetum arvense), cod liver oil extract, D-biotin, bulking agent (microcrystalline cellulose), stabilisers (hydroxypropyl methyl cellulose; magnesium salts of fatty acids), anti-caking agent (cross linked sodium carboxy methyl cellulose), glazing agents (glycerol; talc), colours (titanium dioxide; iron oxides). Always read the label. Not recommended for those allergic to fish. Aqua, sodium laureth sulfate, decyl glucoside, cocamidopropyl betaine, phenoxyethanol, C12-13 alkyl lactate, guar hydroxypropyltrimonium chloride, hydroxypropyl oxidized starch PG-trimonium chloride, butylene glycol, starch hydroxypropyltrimonium chloride, menthol, citric acid, sodium lactate, sodium chloride, benzoic acid, urea, lactic acid, dehydroacetic acid, glycerin, PPG-26-buteth-26, PEG-40 hydrogenated castor oil, levulinic acid, P-anisic acid, apigenin, oleanolic acid, biotinoyl tripeptide-1. Aqua, behenamidopropyl dimethylamine, cetearyl alcohol, shea butter ethyl esters, lactic acid, butylene glycol, sodium phytate, menthol, sodium benzoate, potassium sorbate, PPG-26-buteth-26, PEG-40 hydrogenated castor oil, apigenin, oleanolic acid, biotinoyl tripeptide-1. Aqua, hydroxyethyl acrylate/sodium acryloyloyldimethyl taurate copolymer, glycerine, simmondsia chinesis seed oil, aesculus hippocastunum seed extract, benzyl alcohol, mentha piperita oil, sodium, phytate, potassium sorbate, glycine, sodium metabisulphite, larix eurpoaea wood extract, citric acid, zinc chloride, camelia sinsensis leaf extract, alcohol. (1 tablet in the morning and 1 tablet in the evening taken with water after food). Subscribe to our newsletter to stay up to date on the newest research within the field of hair growth disorders, information about upcoming events and competitions with Nourkrin® Man. I accept the conditions of consent. Would you like to know more about the Nourkrin® products? © Nourkrin®. ALL RIGHTS RESERVED. Nourkrin® is a brand from Pharma Medico. Do you need help, information, or just want to get in touch with us?